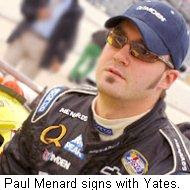 Paul Menard will leave Dale Earnhardt, Inc. to drive for Yates Racing next season. That announcement was made earlier today, ending a multi-week bidding war between DEI and Yates for the young driver’s services. Menard’s car number and crew assignments were not announced today. Menard’s move almost certainly makes DEI a single-car team next season, with only Martin Truex Jr.’s Bass Pro Shops/Tracker Boats team expected to return. The #15 car's Menards sponsorship will move to Yates Racing in 2009, while the U.S. Army will leave Aric Almirola’s #8 Chevy at season’s end, reportedly to join Ryan Newman at Stewart-Haas Racing. Regan Smith’s #01 has raced with only partial backing from Principal Financial Group this season, and is reportedly the topic of discussions between DEI and Richard Childress Racing. Childress is said to be interested in purchasing the team, then transferring it’s Top-35 owner’s points to his new #33 Chevrolet, to be driven by Clint Bowyer. The phones are ringing all over Charlotte today, with DEI employees scrambling to find new positions for next season. As we reported weeks ago, DEI management continues to investigate possible mergers, partnerships, and even the outright sale of the team, without success. DEI’s John Story declined to comment when contacted earlier today. And Finally: Red Bull Racing announced this morning what Sirius Speedway told you yesterday, that Mike Skinner and Scott Speed will replace AJ Allmendinger in the No. 84 Red Bull Toyota for the remainder of the 2008 season. Skinner will drive the #84 in the next two races at Talladega and Lowe’s Motor Speedway, with Speed taking the reins at Martinsville for the remainder of the season. Speed will drive a third #82 Red Bull Toyota at Lowe’s on October 11, the same weekend he attempts to clinch the ARCA RE/MAX Series championship at Ohio’s Toledo Speedway. NASCAR Sprint Cup Series racing has become big business, and there's no better example of that than the situation currently surrounding Kyle Petty. According to numerous sources in the Sprint Cup garage, yesterday’s Camping World RV Sales 400 at Kansas Speedway may have been Kyle's last race for Petty Enterprises. Petty has said little about his future with the team, other than that he would like to continue running a limited schedule of events next season. His wife, Pattie, has been more outspoken, however, telling the Winston-Salem Journal this weekend that her husband is effectively being forced out by the team his grandfather chartered in 1949. "Maybe I'm the only one here willing to tell the truth," she said. "They told him at Watkins Glen -- right when he was standing there in his driver's suit -- that they didn't want him in the car. They haven't wanted Kyle in the car the last three years. They want a young driver… but Wells Fargo, our sponsor, says it's going to stay with Kyle, whatever he does. "I wish Chip Ganassi would take a look at Kyle. He's got a 12-race sponsorship deal for next year that would be a perfect part-time schedule. And Kyle could help mentor a young driver." Petty Enterprises Vice President for Racing Operations Robbie Loomis said recently that the team's current level of performance will not allow them to hire a championship contending driver, or another former champion like Bobby Labonte. Instead, Loomis said he hopes to cultivate a new superstar, plucking a talented youngster from the ranks and working with him to create a a winning team. To that end, AJ Allmendinger is said to be talking to Petty Enterprises about a spot in the #45 Dodge next season, as are current Michael Waltrip Racing driver Michael McDowell and Chad McCumbee, who has driven a limited schedule in the #45 Dodge in each of the last two seasons. At age 48, Kyle Petty is obviously not the future of Petty Enterprises. The question is, how much time should the team give him to ease out of the driver's seat? 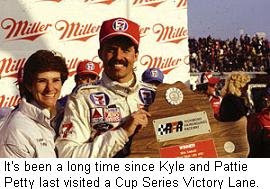 The last of his eight career NASCAR Sprint Cup Series wins came in 1995, when Winston was still the series sponsor, and Felix Sabates' Coors Light Dodge was one of the hottest rides on the circuit. It's been a long, long time since then. Petty has finished no better than 15th in points since 1994, and in his last two full-time seasons -- 2005 and 2006 -- he finished 27th and 32nd in points, respectively. His best finish this season came at Richmond a few weeks ago when he finished 24th, and he has failed to qualify twice; at Martinsville and Phoenix. Most drivers with numbers like that find themselves out of a ride, and quickly. But Kyle Petty is not "most drivers." He is the last of NASCAR's greatest family of drivers, running the final races of his career in the lingering shadows of his legendary father and grandfather, in memory of the son who should have lived to carry on their legacy for at least another generation. In a perfect world, Kyle Petty should be able to choose his own exit strategy. He should be able to run part-time schedules until his heart and conscience agree that it's finally time to go. But NASCAR Sprint Cup racing is far from a perfect world. It's a heartless, "what-have-you-done-for-me-lately" business that values performance over emotion, and has no use for pity. Petty Enterprises probably cannot afford another season at the back of the pack. Another year of status-quo will put them even further behind, and leave them 12 months further away from finding that young lion to lead them back from the brink. But before the new driver arrives, Kyle Petty has got to go. It's a process none of us are especially anxious to watch. 10. Any driver whose name on the roof is written larger than the sponsor on his rear quarterpanel. 9. Television and radio announcers who watch a group of NASCAR drivers exiting pit road en masse and exclaim, “It’s a drag race!” I’ve been to a few NHRA events, and in my opinion, any “race” that includes a 35 mph speed limit is no race at all. 8. Callers to national radio shows that preface their comments with a 15-minute expose on which driver they root for, and why. 7. Public relations people who critique their performance based on how many times they said “no” today. 6. Drivers who’ll talk for an hour after a win, but won’t talk at all after the wreck. I understand it, but I still don’t like it. 4. Reporters who describe a driver or crewchief as having “a big smile on his face.” Where else would he be wearing a smile, if not on his face? 1. Drivers who dump the leader on the final lap, then act like they just discovered a cure for cancer in Victory Lane. Red Bull Racing confirmed today what Sirius Speedway first told you late last week, that driver AJ Allmendinger will not be part of their plans for the 2009 NASCAR Sprint Cup season. Allmendinger will be replaced by veteran Mike Skinner at the wheel of the #84 Red Bull Toyota in this week’s open test at Lowe’s Motor Speedway, joining Scott Speed and Brian Vickers. No announcement was made on the team’s 2009 driver lineup, but Speed is widely expected to take the wheel of the #84 Toyota. Allmendinger has not commented on his release, but is reportedly talking with both Petty Enterprises and Chip Ganassi Racing with Felix Sabates about 2009 Sprint Cup Series openings. There is no word on whether he will finish out the season with Red Bull, but he is listed as driver of the #84 Red Bull Toyota for this weekend’s race at Kansas Speedway. 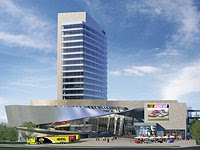 Hall Increase Approved: The Charlotte City Council agreed yesterday to increase the NASCAR Hall of Fame’s budget by $32 million, but only after chastising Hall officials for low-balling initial estimates. The bulk of the additional money will go toward improved exhibits, and was approved by the council on a 9-2 vote. The additional money will boost the Hall's total cost to $195 million; paid for by hospitality taxes and revenue generated by land sales. Mayfield Testing: Jeremy Mayfield is testing the No. 41 Chip Ganassi Racing Dodge today, in the first of a two-day test at Lowe’s Motor Speedway. Mayfie of three drivers testing for Ganassi, joining Juan Pablo Montoya and Bryan Clauson. A team spokesman confirmed that Reed Sorenson is still scheduled to drive the car this weekend at Kansas Speedway. And Finally: Anyone tempted to write Kyle Busch out of the 2008 championship chase need only to look at past history for an excuse not to do so. Busch is currently 12th in points --210 out of the lead -- with eight races to go. The good news is that in 2006, Jimmie Johnson was seventh in points -- 146 out – after five races in the Chase, before going on a late-season hot streak that earned him the 2006 championship. Suspended officials Tim Knox and Bud Moore have reportedly been dismissed by NASCAR. The two were suspended following an investigation into a $225 million sexual harassment and racial discrimination lawsuit filed by former official Mauricia Grant. Knox and Moore were accused in the suit of exposing themselves to Mauricia Grant. NASCAR has denied Grant's allegations. Another former technical inspector has filed a complaint against NASCAR with the Equal Employment Opportunity Commission, alleging racial discrimination, a hostile work environment and wrongful termination. Dean Duckett, who is also black, told The Associated Press Saturday that he will consider filing a lawsuit of his own if NASCAR refuses to give him his job back. Duckett was fired in November of 2007 after a heated argument in which he told another official, "I ought to cut you.” He was also accused in Grant's lawsuit of dumping water on another female official to simulate a wet T-shirt contest, a charge he denies. NASCAR Gets Random: Until now, NASCAR's substance abuse policy has been long on punishment, but short on detection. That all changed this weekend, when the sanctioning body announced changes that make its substance abuse policy the most comprehensive and stringent in all of professional sports. Random drug testing will be the law of the land in NASCAR beginning in 2009. All drivers in the three national series -- Sprint Cup, Nationwide and Trucks -- must now be tested prior to the start of next season, and team owners must verify that all licensed crewmembers have been tested by a certified lab. 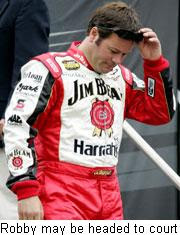 NASCAR will also test all its officials prior to the start of the 2009 season. In short, everyone -- drivers, over-the-wall crewmembers and officials – will be subject to random tests throughout the season; a major improvement over the previous NASCAR policy, which allowed testing only in cases where "reasonable suspicion" existed. Penalties will continue to include immediate suspension from competition, and a possible lifetime ban for a first violation. Third-time violators will automatically receive in a lifetime ban. Musgrave Out Of Harris Trucking #59:Ted Musgrave and the HT Motorsports Craftsman Truck Series team parted ways Saturday, just hours prior to the Qwik Liner Las Vegas 350 at Las Vegas Motor Speedway. Musgrave wrecked the team's primary truck in the opening laps of practice Saturday, and reportedly exchanged harsh words with team owner Jim Harris immediately after. 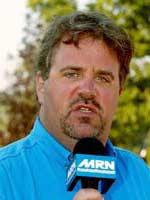 He told MRN Radio, "I'm sick of driving bottom of the barrel (trucks). I'm not going to do it anymore." Harris tabbed veteran Stacy Compton to drive the No. 59 Saturday night, and said a decision on who will drive for the rest of the season will be made later this week. 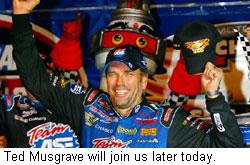 Musgrave will join us on Sirius Speedway Monday to discuss the situation. Keselowski Goes Kup: Brad Keselowski will make his NASCAR Sprint Cup Series debut at Lowe's Motor Speedway on October 11th, driving for Hendrick Motorsports. Keselowski will attempt to qualify a fifth Hendrick entry -- the No. 25 GoDaddy.com Chevrolet -- for the race, and also the November 2 Dickies 500 at Texas Motor Speedway. He is currently third in NASCAR Nationwide Series championship points, with two wins, 10 Top-5 and 16 Top-10 finishes for JR Motorsports. Texas Terry To Kansas: Petty Enterprises Vice President of Race Operations Robbie Loomis said Sunday that the team is seriously considering putting former Spring Cup champion Terry Labonte in the #45 Dodge at Talladega. 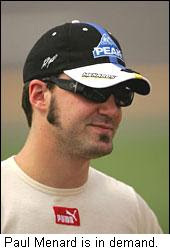 Loomis said Kyle Petty will drive this weekend in Kansas, with Chad McCumbee taking the wheel at Lowe's Motor Speedway. McCumbee is expected to drive in four or five more races this season, as the team attempts to settle on a driver lineup for next year. In a related story, Loomis said he is not interested leaving Petty Enterprises to take a similar position with the new Stewart-Haas Racing Team next season. And Finally: Published reports this weekend said that A.J. Allmendinger may have driven his final race for Red Bull Racing. 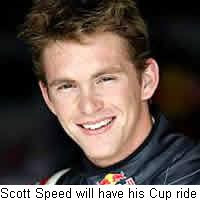 He was reportedly told last Wednesday that he will not return to the team in 2009, replaced by Scott Speed. Yahoo Sports reported today that he may give way to veteran Mike Skinner this weekend at Kansas Speedway, with Speed running at least some of the remaining races this season. Allmendinger is reportedly close to signing a new deal with Chip Ganassi Racing with Felix Sabates, to drive the #41 Target Dodge in 2009. DEI President of Global Operations Max Siegel admitted today that his team is embroiled in a bidding war for the services of driver Paul Menard in 2009 and beyond. Siegel told the Charlotte Observer, "We're in the heat of competition for Paul. As of right now, nothing has changed, but my gut feeling seems to change frequently." Sources say DEI and Yates Racing are both negotiating to sign Menard to multi-year contracts, but Siegel and Doug Yates both insist that no deals have been made. Yates says only that he would like to expand to four teams in the future, while admitting that he has talked to Menard, and feels he has “a very good chance” to sign him. "I think this will all come together one way or another with Paul shortly,” said Yates at Dover International Speedway today. “I'd like to be able to answer the question today, but I can't." Menard is in his second full season of Sprint Cup competition, and has recorded just one top-10 finish in 66 career starts. He currently ranks 27th in championship points. 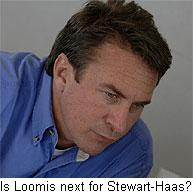 Stewart-Haas Wooing Loomis: Sirius Speedway has learned that Petty Enterprises Vice President of Racing Operations Robbie Loomis is now at the top of Stewart-Haas Racing’s wish list, as they attempt to hire a new Vice President/General Manager. Red Bull Racing’s Jay Frye recently turned down the job in favor of remaining in his current position, and sources says Stewart-Haas is now interested in talking with Loomis. In other personnel news, McLaren’s Head of Formula One Race Operations, Steve Hallam, is reportedly set to join Michael Waltrip Racing’s NASCAR Sprint Cup Series team in a yet undetermined position. Carmichael Goes Trucking: Kevin Harvick Inc. will expand its NASCAR Craftsman Truck Series operation to three trucks next season, adding former motocross champion Ricky Carmichael to the stable. Team owner Kevin Harvick confirmed the move today, saying, "We want to put Ricky in a third Truck. He knows how to race, whether it's a car or truck or motorcycle. He's got that will and determination to make something happen. I like what he's done in the Camping World East Series." Harvick said sponsorship still must be secured for the new entry. He also revealed that KHI will field a full-time NASCAR Nationwide Series Chevrolet, to be driven by himself and Cale Gale. And Finally: The rumors continue to swirl concerning possible mergers for Chip Ganassi Racing with Felix Sabates. Within the last three weeks, the team has been reported ready to merge with Michael Waltrip Racing, Penske Racing and Robby Gordon Motorsports, along with unconfirmed reports that Ganassi might bow out of NASCAR entirely. The latest comes from Sports Illustrated’s SI.com, which reported today that Ganassi is planning to join forces with Gillett Evernham Motorsports; the same team that just days ago was said to be ready to purchased Bill Davis Racing’s Cup operation. Gillett Evernham’s Mark McArdle confirmed recently that the team is interested in acquiring a fourth car with a guaranteed spot in the Top-35 in owner points for next season. Ganassi has two cars currently in the Top-35, but has strongly denied any talks with Gillett-Evernham, saying he currently has no plans to merge with anyone, plans to run two cars full-time in 2009, and is in the sport for the long haul. Spokesmen for Gillett-Evernham declined to comment on the latest report. A disabled rights activist has filed a lawsuit against Infineon Raceway, alleging that the track is in violation of the the Americans with Disability Act, due to non-compliant seats, parking, infrastructure, ticketing procedures, restrooms and other issues. Richard Skaff --who is paraplegic -- filed the suit September 8th in U.S. District Court in San Francisco, after attending a NASCAR Sprint Cup Series race at Infineon in June, and an NHRA drag race in July. In the suit, he claims the track failed to provide the required number of handicapped seating, that the seating was in the most expensive areas of the speedway, and placed where fences, handrails and other fans resulted in obstructed views. He said disabled parking areas were inadequate, that the track did not provide accessible paths to and from shuttles, and that he was unable to access ticket windows, displays, concessions and vendor areas, since many of those amenities were too high for him to reach. He also said restrooms were not compliant with state and local laws. Skaff is seeking an unspecified amount of damages, and for the court to order track into compliance. Infineon Raceway President Steve Page said he believes the facility complies with all applicable laws, and promised a vigorous defense against what he called, “meritless claims." Loomis Backs Hendrick: Former Hendrick Motorsports crewchief Robbie Loomis says Rick Hendrick is correct in his belief that Dale Earnhardt Jr. needs to focus more and vent less in his raceday communication with crewchief Tony Eury, Jr. Loomis, now the Executive Vice President of Racing Operations for Petty Enterprises, said it’s difficult for a crewchief to fix a mishandling racecar after its driver loses his cool. And Finally: Las Vegas Motor Speedway has invited the Germain Racing and Red Horse Racing Craftsman Truck Series teams to settle the grudge match that resulted in fisticuffs last weekend in New Hamphshire Motor Speedway. The track has offered to host a tug of war as part of Saturday night’s prerace ceremonies for the Qwik Liner Las Vegas 350. General Manager Chris Powell issued the invitation, saying, "I'm sure both of those teams left New Hampshire feeling that nothing was settled…and we want to afford (them) the opportunity to get their aggression out before the race. We're happy to supply the rope." No word on whether the teams will accept the invitation. Just past the 200-lap mark in yesterday’s Sylvania 300 at New Hampshire Motor Speedway, Dale Earnhardt, Jr., was not a happy camper. A five-second lead had disappeared due to a bad set of tires, dropping his National Guard/AMP Energy Drink Chevrolet back through the field; the latest in a season-long series of late-race fades. 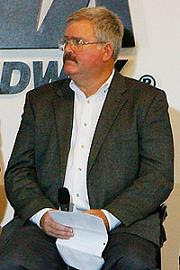 As has often been the case this season, Earnhardt vented his frustrations over his in-car radio, placing the blame squarely on his team and his crewchief, Tony Eury, Jr.
Earnhardt’s blow-up triggered what has been a common response in recent weeks, with team owner Rick Hendrick stepping in to quell the feud. "You've got a great car right now,” said Hendrick. “Just take it easy." The conversation that ensued illustrates the frustration Earnhardt clearly feels with his team, and how unhappy Hendrick is with his superstar driver’s complaints. Earnhardt: "This is f-ing bulls---." Hendrick: "You got a bad set of tires. It happens." Earnhardt: "I need to find another series that runs half-distance races." Hendrick: "You can do this. Talk to everybody about what the car is doing. We can make the right adjustments." Earnhardt: "I'm pissed off. Sometimes you go your fastest when you're pissed off. So we'll see." Hendrick: "Take it out on those guys in front of you." Hendrick said he believes it’s time for Earnhardt to spend less time venting about his on-track problems, and more time discussing solutions. "If he doesn't want Tony to go anywhere -- if he's put a stake in the ground that he wants Tony Eury Jr. -- then he needs to treat him a little better on the radio." Hendrick said he believes Earnhardt’s hair-trigger temper damages his ability to communicate with his team, adding, "I've had the benefit of listening to a lot of drivers over a number of years. To my knowledge, I've never had (a driver) that gave us good information when he's on the chip." The situation between Earnhardt and Eury is not unique. One week ago, Tony Stewart lashed out at crewchief Greg Zipadelli and his Home Depot team in a similar fashion, after a balky final pit stop cost them the lead (and possibly the win) at Richmond. Within Hendrick’s own camp, Jimmie Johnson and crewchief Chad Knaus endured a rocky early relationship before a “come to Jesus meeting” with the boss convinced them to put their individual interests aside and begin working together as a team. 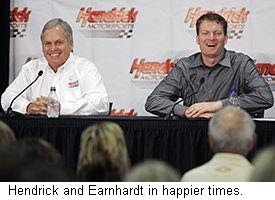 "I think they can be better," said Hendrick of his Earnhardt/Eury combo. “I know Tony will help him more if he's calmer when he's giving information. When you say, 'I'm so loose, I'm so loose,' you've got to talk about your drive off and your entry, so you know if you fix one you're going to hurt something else." 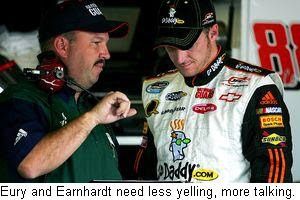 Earnhardt clearly enjoys venting his emotions in the racecar, believing that it motivates him to post faster lap times. But while admitting being too hard on Eury at times, NASCAR’s most popular driver shows no willingness to change. If Junior won’t mend his ways voluntarily, Hendrick will have to force a change, reining-in Earnhardt’s temper and demanding that he work more efficiently – and less critically -- with his team. 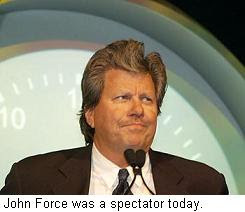 It is a job the longtime NASCAR team owner seems willing to undertake. "It is frustrating," Hendrick said. "I don't think he realizes how strong he comes across. He's either going to wear me out, or I'm going to wear him out." Look at it as an easy way to avoid going bankrupt at the blackjack table. A number of crewmen for the David Starr and Todd Bodine NASCAR Craftsman Truck Series teams will likely get next weekend -- and a few more after that -- off, in the aftermath of a postrace donnybrook at New Hampshire Motor Speedway Saturday. Starr tangled with both Bodine and his Germain Motorsports teammate-for-a-day, David Reutimann in the latter stages of Saturday’s Camping World RV Rentals 200, sending both Bodine and Reutimann into the wall and out of contention. Bodine bumped Starr’s truck from behind as they exitted the track after the race, and several Germain crewmembers were waiting for Starr when he arrived on pit road. One of them unfastened Starr’s window net and allegedly spit on him, with a major confrontation ensuing. Starr exitted his truck and landed a pair of first-class haymakers to the face of the offending crewmember, as at least a dozen other crewmen waded into the fray. It took NASCAR officials 3-4 minutes to quell the uprising, and just as order seemed to have been restored, the fight flared up again. 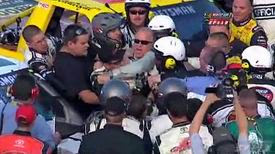 At least one NASCAR official appeared to be knocked to the ground in the melee, and a number of others were shoved aside by brawling crewmen. One NASCAR security official left the scene with blood –- apparently someone else’s -– splattered across his shirt. Starr and his crewchief, Rick Gay, were summed to the NASCAR hauler after the race, as were Bodine’s crewchief, Mike Hillman Jr. and three other Germain team members. 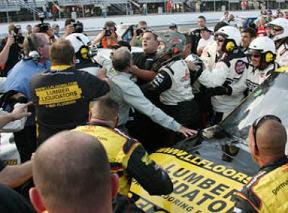 Bodine was not involved in the fracas, choosing to sit it out in his truck. “My crew was upset,” said Bodine once calm had beeb restored. “They deserve to be. (Starr) wrecked both of our trucks. One thing about Germain Racing is everybody works on everything. Everybody takes it personal when somebody wrecks their vehicle, and he wrecked both of ours today. Expect NASCAR to hand down a series of multi-race suspensions and fines as early as Tuesday. Sirius Speedway has learned that GEICO Insurance will team with Italian road course expert Max Papis to run as many as 18 NASCAR Sprint Cup Series races next season, in Toyotas fielded by Germain Motorsports. GEICO currently sponsors veteran Mike Wallace on the NASCAR Nationwide Series, but cannot remain in NASCAR’s number two series beyond 2009, due to language in the sanctioning body’s contract with major sponsor, Nationwide. They can, however, move to either the Sprint Cup or Truck ranks. Wallace said recently that he is already looking for a new backer, adding, “We have an indication of what (GEICO is) going to do, (and) for me to continue to race in years to come, I’ve got to go find another sponsor." A spokesperson for Germain Motorsports declined to comment earlier today. In other Nationwide Series news, David Ragan says he expects to compete in the Nationwide ranks again next year, but possibly not on a full-time basis. Ragan is one of four Sprint Cup drivers to run the complete Nationwide schedule this season – along with Carl Edwards, Clint Bowyer and David Reutimann – and said he plans to run at least 25 or 30 Nationwide events in 2009. Bowyer has said he will probably not run all the Nationwide races next year, while Reutimann definitely will not. 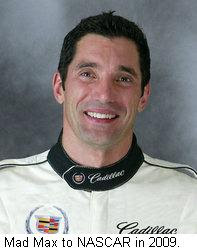 Edwards’ 2009 Nationwide schedule has not yet been determined. And finally, published reports say that Nationwide Series veteran Jason Keller has been informed by CJM Racing that they will not renew his contract for next season, leaving him out of a ride for 2009. 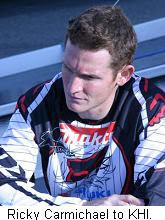 Since making his Series debut in 1991 at Lanier Speedway in Georgia, Keller has racked up 10 wins, more than 80 Top-5 and 160 Top-10 finishes, while becoming the series’ all-time leader in career starts. He is currently 11th in championship points, with a top finish of third at Gateway in late July. 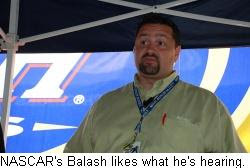 NASCAR Nationwide Series Director Joe Balash sounded understandably proud yesterday, talking about his new baby, the proposed new Nationwide Series “Car Of Tomorrow.” After nearly two full days of testing at Richmond International Raceway, it was difficult to find anyone with anything negative to say about the new racer. Defending Nationwide Series champion Carl Edwards was typical of those commenting on the new car, saying it actually handled better than its Sprint Cup brethren. Edwards called it “a mix between the current Nationwide car and the Cup car,” and expressed happiness with its driveability. Edwards and his Roush-Fenway Racing teammate David Ragan did the testing for Ford, joining Toyota’s David Reutimann, Chevy pilots Scott Wimmer and Morgan Shepherd, and Dodge’s Bryan Clauson. Vice President of Competition Robin Pemberton agreed, saying, “Speaking to some of the drivers, the input I got was the car was very good. A couple actually said they wished they could race this new car tomorrow.” Pemberton said the new design includes all of the safety features found in the Sprint Cup version, utilizing the same chassis and 85 to 90% of the same suspension pieces. The main differences lie in a smaller front splitter, a rear spoiler (in place of a Cup-style wing) and different bodies. Only Toyota has officially announced a body style for the new car; saying that it will utilize the battle-tested Camry. Unconfirmed reports say that Chevrolet will utilize its Malibu body, with Ford running the Taurus, and Dodge going with its new muscle car, the Challenger. Photos of the Ford, Chevy and Toyota entries at Richmond are fairly nondescript, but Ganassi Racing’s Dodge COT has a distinct nose that heavily favors the Challenger. He stressed that while this week’s results are encouraging, there is more testing to be done, specifically on larger tracks. To that end, the Nationwide Series COT will test next at Lowe’s Motor Speedway Oct. 13-14. 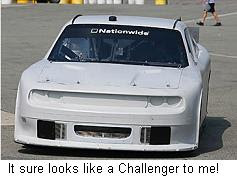 NASCAR will reportedly implement the new car in 2010, giving teams 17 months to covert their fleets. Ms. Hooters International 2008, Sarah Hoots will join us as our "And Now For Something Completely Different" guest, Wednesday at 5:40 p.m. ET. Sara and her twin brother, NASCAR's David Hoots. Separated at birth? Lowe's Motor Speedway owner Bruton Smith chastized the City of Concord and Cabarrus County yesterday, saying city and county officials are attempting to weasel out of a deal they made to pay him more than $80 million in incentives to keep the track in Concord and upgrade the facility. Smith says the deal requires that he be compensated for major road improvements around Lowe’s Motor Speedway within two to three years. But local officials said recently that they may need as much as 40 years to pay him back, a timetable Smith said claims was never discussed. As a result of the latest dispute, Smith said he may not undertake a promised $200 million in upgrades to the speedway, after all. He also said his lawyers are investigating possible fraud, while declining to give specifics. Smith's latest dustup is not the only racing-related item on the financial page this week, after reports surfaced that the price tag for NASCAR’s new Hall of Fame is on the rise. Planners presented a proposal to Charlotte City Council yesterday, requesting an extra $32-million for better exhibits, increased energy efficiency and unexpected increases in construction costs. If approved, the new cost of the project would top $195 million; to be paid for with a combination of hospitality taxes, loans and money generated by land sales. The council is set to vote on the request later this month, but several members criticized the increase yesterday, questioning how the original cost estimates could have been so far off. In addition, some council members say that the Hall’s other partners -- Bank of America, Wachovia and NASCAR – should do their share to help cover the overrun. The Hall’s Executive Director, Winston Kelley, said $17 million of the additional $32 million will go toward more interactive displays and exhibits, making the Hall more attractive to fans. Gillett Evernham Motorsports has filed suit against Robby Gordon, claiming that the Robby Gordon Motorsports owner/driver violated terms of a tentative agreement to sell his team to Gillett Evernham for $23.5 million. As part of the deal, Gordon would have ben given a four-year driving contract with Gillett Evernham that would have paid him $3 million annually, 45 percent of race winnings, plus insurance and other provisions that would boost the total value to at least $5 million annually. Gordon would have been offered a position on the Gillett Evernham board of directors, and Gillett Evernham would have purchased Gordon’s shop in Charlotte. GEM also agreed to provide Gordon with the infrastructure needed to compete, and to support his #7 Dodge in “substantially the same manner in which GEM supports its most supported car in the NASCAR Sprint Cup” during the remainder of this season. The contract also included a clause that barred Gordon from talking with other teams about mergers. The deal was agreed to on Jan. 29, pending an audit and other due diligence from Gillett Evernham. It was signed just three days before the parties announced a technical, manufacturing and marketing partnership. Gillett Evernham says they attempted to close the deal as planned, only to have Gordon ask out of the arrangement in May, in exchange for an engine deal for the remainder of the 2008 season. In the suit, Gillett Evernham says Gordon violated the exclusivity clause by talking to other teams about merging, and told a a DirecTV audience last month at Watkins Glen that his engines were inferior to those of the Gillett Evernham drivers. Gillett Evernham is asking for unspecified damages, and for the agreement to be declared null and void. 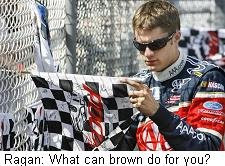 UPS has reportedly reached to a multiyear agreement with Roush-Fenway Racing to sponsor David Ragan and the No. 6 Ford Fusion next season, with an official announcement expected within the next two weeks. UPS will leave Michael Waltrip Racing at the end of the 2008 campaign, after backing Dale Jarrett and David Reutimann for the last two years. Ragan is in his second year of Sprint Cup competition, and ranks as one of NASCAR’s most improved drivers. He is currently 13th in the championship standing, just 17 points out of the Chase with one regular season race remaining. No Big Name For Pettys: Petty Enterprises Vice President of Racing Operations Robbie Loomis said this weekend that the team understands it will probably not be able to sign an A-List driver to join Bobby Labonte next season. 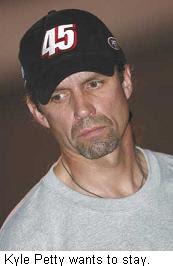 Loomis said Kyle Petty will run some races in the #45 Dodge next year, splitting the ride with a new driver the team hopes can eventually become a big-name NASCAR star. And Finally: The most popular driver in all of drag racing failed to qualify for the sport's biggest race this weekend, and happily, the sport seems to be surviving the blow. For the second year in a row, John Force failed to qualify for today's Funny Car eliminations at the Mac Tools U.S. Nationals at O'Reilly Raceway Park in Indianapolis. For those unfamiliar, Force is a 14-time World Champion, and a bigger draw than either Dale Earnhardt, Jr. or Jeff Gordon in NASCAR. But he failed to crack the top 16 in qualifying yesterday, and as a result, he spent Labor Day Monday watching his daughter, Ashley, race, signing autographs and stopping by the ESPN broadcast booth. You see, the National Hot Rod Association awards no provisional starting spots. They have no Past Champions’ Provisionals or Top-35 lock-ins to ensure guys like Force that they will race every weekend, regardless of performance. Unlike NASCAR, the NHRA prefers to set its qualifying fields on speed and speed alone, with no regard for popularity, point standings, or the size of someone's sponsor. Force’s DNQ was perhaps the biggest story of the weekend in motorsports. It was in all the newspapers, and yet, the grandstands were packed at ORP today. Legions of Force fans did not, in fact, stay home, refusing to support a race that does not include their favorite driver. Force's multi-million dollar sponsor -- Castrol GTX Motor Oil – has also not yet torn up his sponsorship contract. Could the same thing happen here in NASCAR? Could the sport survive if a major star like Kyle Busch, Jeff Gordon, or (God forbid) Dale Earnhardt, Jr., failed to qualify one day?